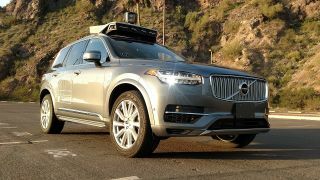 The US National Transportation Safety Board (NTSB) has released its preliminary report into the fatal Uber self-driving car crash in Arizona that happened just over two months ago. While much of what's in the report has already been publicized, it does provide insight into the vehicle's systems and what happened in the seconds leading up to and immediately after impact. Much of the report is dedicated to a breakdown of the night of March 18, when an Uber self-driving car in autonomous mode struck a pedestrian who was walking with her bike outside of a crosswalk. The pedestrian later died of her injuries. The report outlines the equipment and systems found on the vehicle, including lidar, cameras, navigation sensors and other components pertaining to self-driving. The car, a modified 2017 Volvo XC90, also came with Volvo's collision avoidance system that includes automatic emergency braking, according to the NTSB. Citing Uber, the report states that emergency braking is disabled when a vehicle is in "computer mode" to avoid erratic driving. In these instances, the vehicle operator is expected to intervene, however the system doesn't alert the driver that they need to take control of the vehicle. As for the timeline right before and after impact, the car's lidar and radar sensors first noticed a something in the road about six seconds before striking the pedestrian. The vehicle's software first classified the pedestrian as an unknown object, then as a vehicle, and then as a bicycle. 1.3 seconds before impact, the car determined it needed to engage emergency braking, though again this feature was disabled because the car was in self-driving mode. Data collected from the car reveals the driver grabbed the steering wheel less than a second before impact, and began braking less than a second after impact. The driver is seen in video feeds from inside the car looking down several times before the crash. During these moments, the driver told the NTSB in post-crash interviews, she was monitoring the car's self-driving interface. Video feeds from the vehicle's outside cameras show the pedestrian, a 49-year-old woman, wearing dark clothing and not in the direction of the oncoming vehicle before she was struck. The NTSB's initial report doesn't assign probable cause or fault in the accident, and the agency notes it's still gathering data from the vehicle and the driver's cell phones. "Over the course of the last two months, we’ve worked closely with the NTSB. As their investigation continues, we’ve initiated our own safety review of our self-driving vehicles program. We’ve also brought on former NTSB Chair Christopher Hart to advise us on our overall safety culture, and we look forward to sharing more on the changes we’ll make in the coming weeks." There's no word on when the final NTSB report is due, though Uber's CEO said two weeks ago that he expects the company's self-driving car tests to resume "in a few months," once the NTSB makes its conclusions, the proper permits have been obtained, and after making safety adjustments. When Uber does begin testing self-driving cars again, it will be in a more limited fashion, and the program won't be operational in any form in Arizona. That's because Uber announced on May 23 that it's ending its self-driving car program in the state, though it will resume tests in San Francisco, Toronto and Pittsburgh.